When you setup a "GMail" account on your iOS device, you only get your email and calendar. You will not synchronize your contacts. If you wish to synchronize all three, use the iOS Native Apps - Exchange instructions instead. Google Sync is only supported on Apple iOS versions 3.0 and above. Version 4.0 and above is highly recommended. You can check your current version by going to Settings > General > About > Version. If you're running an iOS before 3.0, upgrade to the latest iOS for your device before setting up Google Sync. Check your Safari cookies settings to see if it's set to "From Visited" or "Always" by going to Settings > Safari > Accept Cookies. You may encounter additional authentication steps if it's set to "Never". Google recommends performing a sync with iTunes before setting up Google Sync to ensure your existing contacts and calendars are backed up. With "Google Sync", you can use your iOS native applications to access your Google Apps mail, contacts and calendars. 1. Go to Settings > Mail, Contacts, Calendars. 4. Enter in your name in the Name field. 5. In the Email field, enter in your full email address. 6. 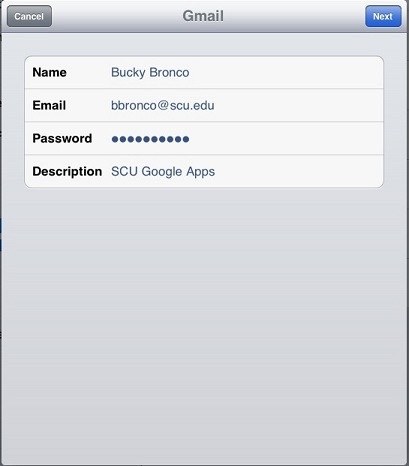 Enter in your Google Apps Mobile device password (NOT your SCU Network ID password) as the Password. 7. For Description, enter in SCU Google Apps. 8. Tap Next at the top of the screen. 9. Confirm that Mail and Calendars are turned On and click on Save. Please note that these are "temporary" instructions on how to synchronize multiple calendars with your iOS device. The procedure to synchronize multiple calendars may change as Google is updating their mobile servers. 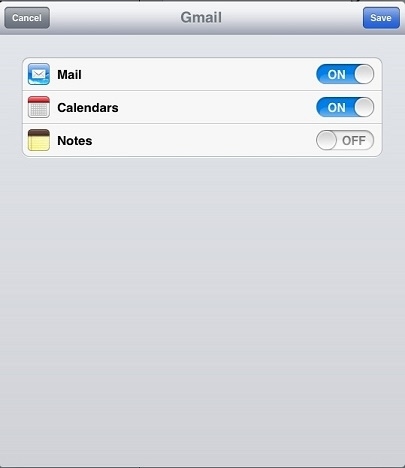 By default, you will receive your main calendar on your iOS device. Use these instructions to add additional calendars (such as shared calendars or additional personal calendars you created within Google Calendar). 1. On either the mobile device or a computer, go to https://www.google.com/calendar/iphoneselect. 2. If you haven't yet signed in, use your full email address as your username and leave the password field blank. Click on "Sign in". 3. You should be directed to the SCU Login screen. Login with your SCU Network login ID and password to continue. 4. From the list of calendars, place a check-mark next to each one you want on your iOS device. Click "Save" to save your changes. 5. You should see a "Device settings saved successfully!" message. 6. In a few minutes, the new calendar(s) will appear on your iOS device. To verify, open the Calendar app on your iOS device and select the "Calendars" button in the top left corner. Your viewable calendars will be listed here. If you do not see the new calendar(s), wait a few seconds and they should get added to the list. 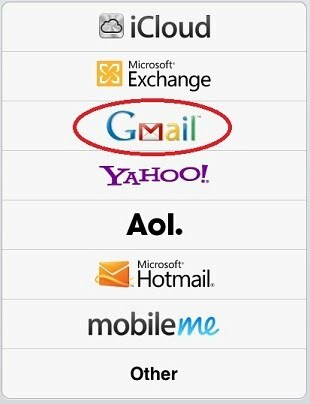 If you use the "GMail" account (versus the "Exchange" setup), you do not synchronize contacts. This optional procedure will allow you to create an additional account on your iOS device which will synchronize just contacts, so you'll end up with email, contacts and calendar. These steps require Apple iOS version 5.0 and greater. 1. On your iOS device, go to Settings. 7. Select Next at the top of the screen. 8. Make sure "Contacts" is turned on. After you've finished the setup, go to your Contacts app and you should begin to see the contacts appear. NOTE: If you have another account which is synchronizing contacts (such as Apple iCloud), you will need to change your "default" contacts if you want new contacts you enter on your iOS device to automatically synchronize with your Google Apps account. 2. Go to Mail, Contacts, Calendar. 3. Scroll down to the "Contacts" section. You will only see the Default Account option if you are synchronizing more than one account. 4. Select Default Account and change it to SCU Google Apps.